Cottontails Baby: Maileg treats giveaway! So I've picked a few things from lovely Maileg to giveaway. 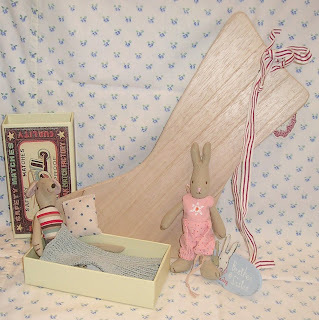 Three things in fact: a baby Brother & Sister bunny in a pretty pink romper, one of their cute little matchbox mice, and a wooden Christmas stocking which can be left as it is in natural shaker-style or can be customised with paints, fabrics etc. I hope people will like them... Humphrey certainly did when I was laying them out on the office floor to take a quick snap! So please leave a comment, and in a week or so I'll put all the names out of a hat (or maybe an alternative vessel, not sure I've got the right kind of hat!) and let Humphrey pick a winner. What a great Giveaway- count me in! Thanks for entering my Giveaway and leaving a comment. 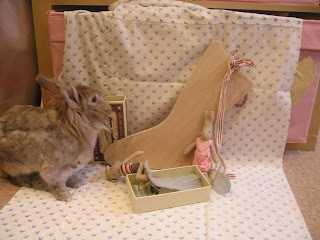 What a gorgeous blog and I love your little bunny. I'm just going to read some of your older posts and then visit your Website. Thanks for your lovely comment on my blog tody. Hey Charlotte, hope the website sales are going well for you and you're not mising your little shop too much. What a lovely choice of goodies to give away, and mighty generous id say! Im feeling rather guilty that ive not had the time to blog properly for ages, maybe i should do a giveaway too?! I would be thrilled to take part in your giveaway. Would you like me to put a link to it on my blog? I have added you to my favourite shops list! ps in case you hadn't already guessed I LOVE MAILEG! Charlotte how lovely about the films! The wonders of the blogosphere at work! Yes please include me, I LOVE MAILEG! Thank you for your lovely comments on my blog. Yu sell so many beautiful things. I am a big fan of Moulin Roti toys, beautifully made and so sweet. They take me back to when Miss P was a toddler. oh my goodness... I just happened to find your lovely blog. Your bunnies are amazing. I just had to become one of your followers. I am off to check out your shop ... where I am sure to find sweetness at every turn. Hello ...found you through Our new life in the country... do pop over to The Hen House where I like to chat or The Linen shelf where I'm trying to create ! You just missed my first give away ...I really enjoyed doing it ! Please can I join yours ? Hi Charlotte! Thank you so much for stopping by Bunny Rose Cottage! I am so happy to meet another bunny lover :) Humphry is sooooo cute!!!! I absolutely adore him :) I want to kiss and snuggle him :) The bunny in my photo is my beloved Ruby. She is no longer with us :( I have two other HUGE sweet buns named Cupcake (he is white with pink eyes) and Mzx who looks just like an Easter bunny, big and fluffy. I adore them! I love these bunny dolls you have shown! Oh are they ever cute. I collect anything with a bunny! What a great giveaway! The things you picked are gorgeous. I just found your blog and am enjoying looking around. What a sweet giveaway! Love your bunny. I am off to see Bright Star with my best loveliest friend today, so excited but armed with a whole pack of tissues, I am such a softy! As we share films I thought you would be going too? I have just found ou via Sarah Jane. What a beautiful blog you have. I'm off to have a bit more of a read. I just found you on another blog and hopped on over and I'm so glad I did. Thanks for stopping by my blog. It is so great to hear from another bunny lover! This is a great giveaway. Please include me! I should do one too. This seems very fun! What a savvy choice of giveaway! - Just discovered Maileg and love it. All of it!